This page introduces various kinds of African foods, where to eat or buy in Japan. We shall also feature some African recipes for those who might be interested in cooking at home. Yam is the king, and the mother of all African foods. It is the favorite for all traditional ceremonies. When an African, especially a West African has anything to celebrate, when there comes an important guest, this is the main dish. In some African communities, the name yam is synonymous with food. Like the Japanese call rice "gohan" which also means food, the Ogonis in Nigeria call yam "zia or ka-zia", meaning food or the mother of all foods respectively. It is the staple foods in many African societies and many varieties are cultivated and eaten. 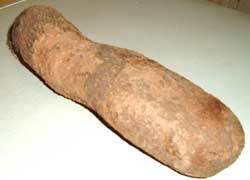 A yam tuber can be stored without refrigeration for over six months making it a secure source of food for a family. For an African,Yam is so important, it is celebrated yearly. The New Yam Festival is celebrated every year at the start of every harvesting season. A major traditional festival, it ushers in the year’s new produce from the farms. This festival is now a major tourist attraction in most parts of Nigeria and it now encompasses not only farm products but a celebration of whatever successes one may have achieved in his/her profession or business for the marked period. In some communities, people may not eat the new yams until its been blessed or purified at the New Yam Festival. Pounded yam is the most popular. 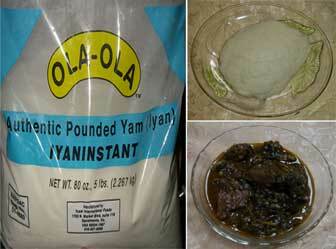 The modern day pounded yam comes in processed powder form. Preparation is simple; just boil hot water, pour in some yam powder and steer (while keeping the fire low) till you have the paste(pic above) then serve with soup. It is delicious and a good source of fibre, carbohydrate and protein. In the villages, whole yams are pilled and sliced then boiled. When it is fully cooked, the yam slices are then pounded in a local mortar to produce a thick paste; something similar to mashed potatoes but much thicker and smoother. This is then served with soup, egusi(melon) soup, okra, pepper soup, vegetable soup or any other soup preferred by the family. Yam may also be eaten fried(like fried potatoes), boiled served with stew or in form of porridge. Buy: E-Mail! Buy: E-Mail! Buy: E-Mail!